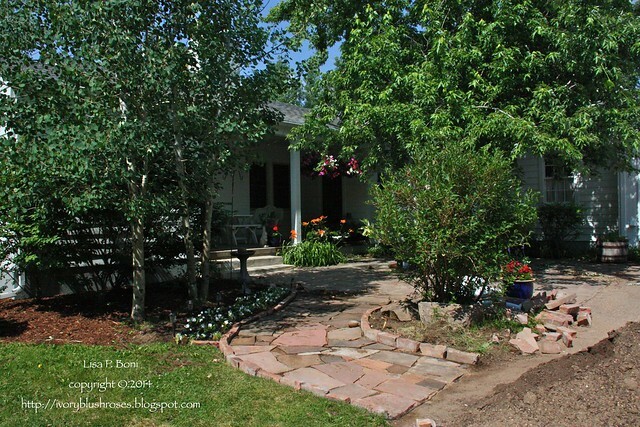 Yesterday, we finished the front flagstone path and cleared the flowerbed along side of it. It's a joy to have this done! Over the winter, I had planted some bulbs in a big barrel, which didn't come up until very late in the spring. They never bloomed but have been growing well. 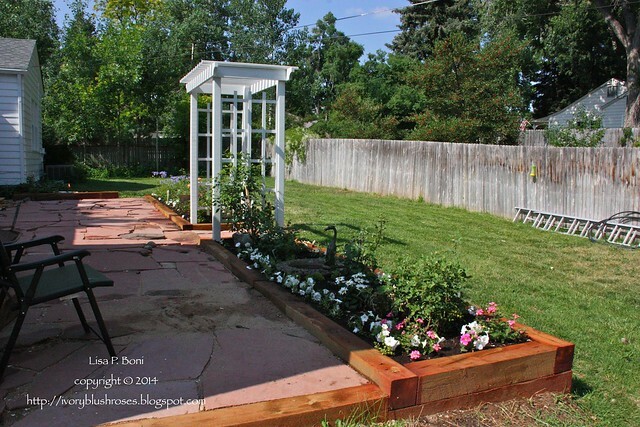 I transplanted them along with lots of white impatiens to the flowerbed under the aspen trees. For the life of me, I cannot figure out what kind of bulbs they are, so I guess we will wait and see! The lilac bed got planted with some pale yellow marigolds, blue lobelia and a couple of dahlias to fill in the open spaces. It looks a little spare now, but I'm hopeful it will fill in and look nice by the wedding in a little less than 4 weeks! 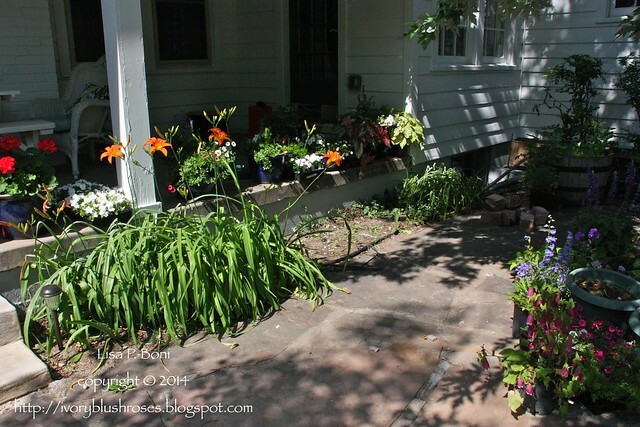 I filled a blue pot with a bright fuchsia pink geranium and put it on the corner of the step. There is another identical one on the far side of the driveway. There are also two large whiskey barrels that have been similarly planted on the side patio. The side gardens are coming along. They had been sadly neglected with all the other work, but I've been weeding like crazy the last few days and tucking small plants in here and there. The morning glories are growing and will soon cover the tuteurs! Between the shed and the first garden, we added more flagstone path with a couple more mosaic pieces we found around the yard. We also planted a rose against the shed. 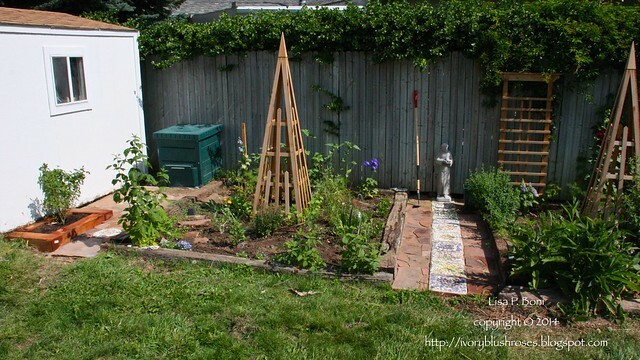 It's a small climber and I'll add a trellis against the shed to help control it. The variety of this one is "Ruby VooDoo", a Colorado born "own root" rose that has nice deep pink blooms on it off and on through out the late spring and summer. In the garden, a hollyhock that I transplanted from behind the shed has finally decided it is happy and is blooming away! 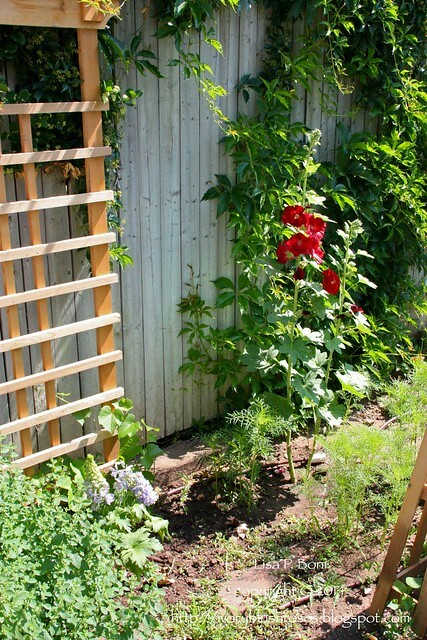 One of my favorite childhood memories is being with my Grandma Plooster in her garden and the hollyhocks towering over her! I have some newborn hollyhocks, planted from seed my sister sent from her garden in Arizona. Can't wait until they grow big enough to bloom, though that may not be until next year! Love having these bits in my garden that remind me of loved ones! The beds on either side of the arbor have been planted to the hilt with white petunias, roses, lobelia and other tidbits here and there! When I stopped at the garden center last week, I found a nice healthy Zepherine Drouhan climbing rose that I was wanting for the other side of the arbor, so it is now planted fully! I was sure that I wouldn't be able to find one until next spring, so it was a joy to find! I also added a white Glamis Castle English Rose to the far bed, which I had been wanting. Now it's just down to the last few projects to finish. I didn't quite make my end of June deadline that I was hoping for, but close enough for comfort! 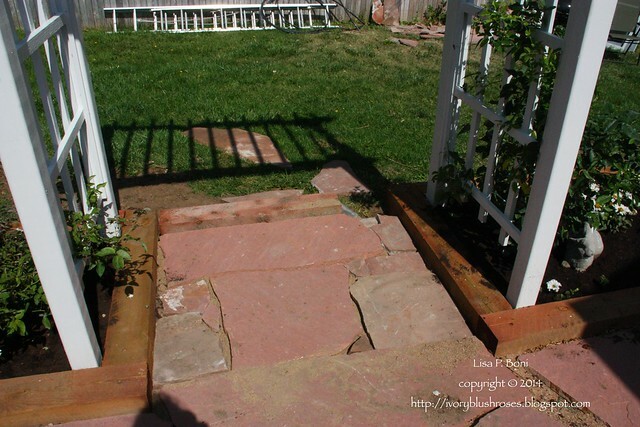 This walkway under the arbor still needs a beam cut and placed to hold the flagstone in place. About 2/3rds of the back patio still needs leveled out with sand to provide a smooth even surface. I need the boys to help with that as many of the big pieces of flagstone we used are far too heavy for me to lift. Unfortunately, they are on mandatory overtime for the next two weeks for the plant that they work for, so this may be a last minute finish right before the wedding. On the side patio, I am getting desperate to get this bed dug up, edged with flagstone and planted. The daylilies look nice now, but most of the time, they just look weedy and unkempt to me, so I'd like to replace them with bleeding hearts. I have an assortment of pink and white impatiens, caladiums and some Astrantia Major, a favorite plant that I learned about in England a couple years ago, to plant in this bed once it finally gets dug up. 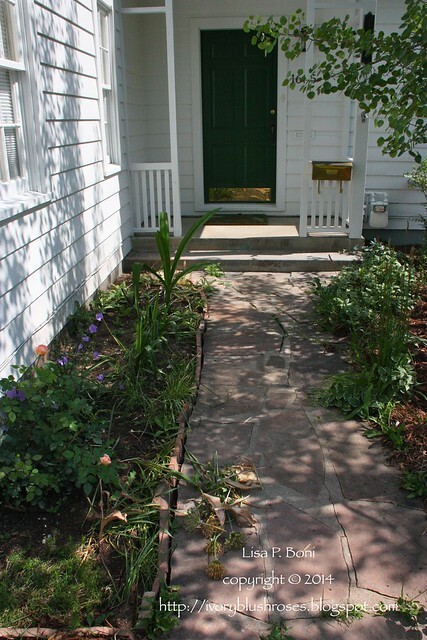 The front bed, which looked glorious this spring, is looking a little unkempt and bare now. I've planted some new perennials here since I took this photo, but need to add some annuals to give it some color and fill it out. The Abraham Darby rose that grows along the front walkway is blooming nicely though! It is one of my favorites! This forsythia bush sits between the side patio and the new flagstone path that curves around it. I hope to get the weedy undergrowth torn out, the bed edged with flagstone and maybe some annuals planted around it or possibly just mulched really well! I have one more rose to plant for now. 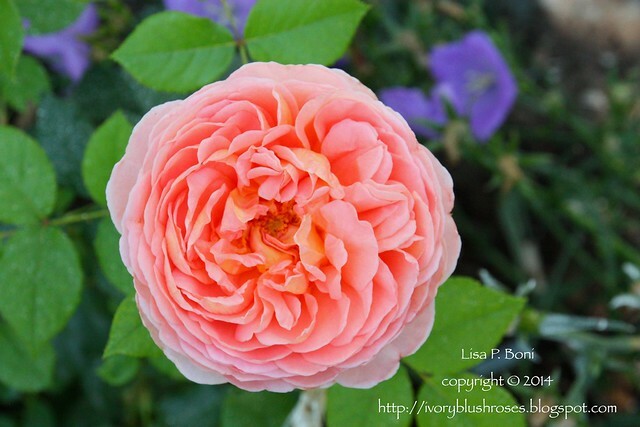 This is a Climbing All Ablaze rose. I'm not usually a fan of red roses, but this one has small cardinal red blossoms that I just loved. 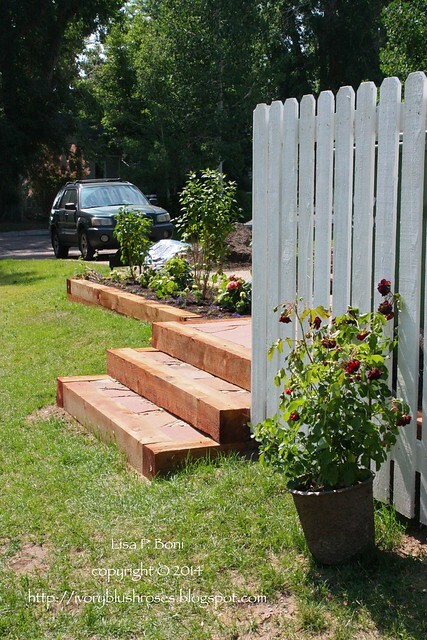 I'll train it along the fence around the garbage cans and hope that it won't overpower the space too much! There is a lot of clean up to be done in the yard as well. - I have all the old storm windows from the house that were removed that need cleaned up, painted and stored somewhere. - The painter left a ladder and needs to come pick it up. - There are about 2 tons of flagstone that need to be moved to my oldest son's house where he has a project in the works for it. Most of it has been moved up to the driveway to facilitate loading it, but there is still a pile in the back yard near the shed. - Then there is the extra yard of topsoil/compost mix that I didn't need after all. A neighbor will make use of some of it, but there is still nearly a cubic yard or more of it left! 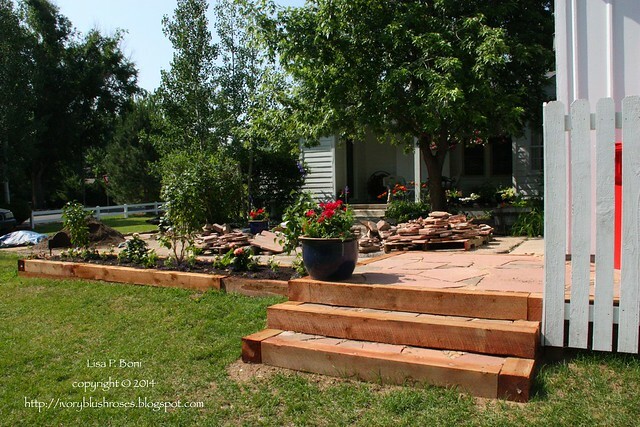 - The landscaper still needs to add sod in part of the back yard to bring it up to level. - And the sprinkler system that we've put so many holes into, is "mostly" back into shape, but still has one area of drip system that needs completed. 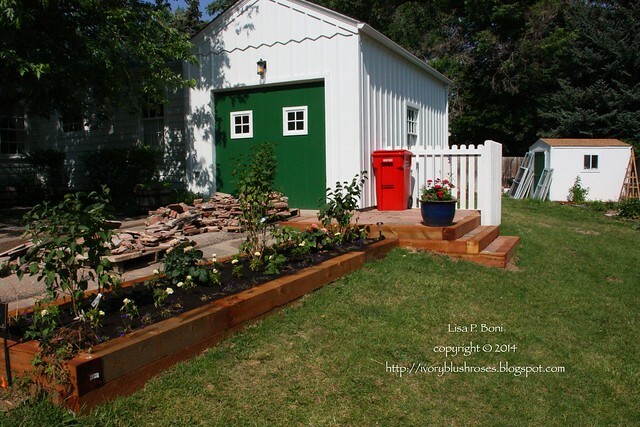 - We need to install beams around one more flower bed along the back fence near the shed where I hope to plant a rose from one of my CQ friends in the early autumn! - And the beds between the back patio and the house need neatened up before the wedding. Next year, I'll clean them out and plant more roses there. 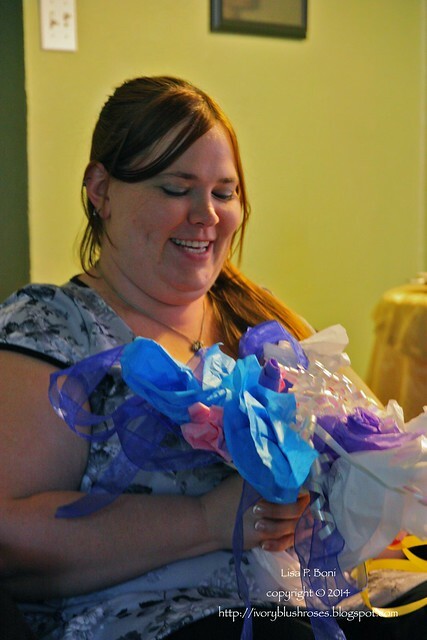 I'm anxious to get all these things finished up so we focus on wedding preparations! 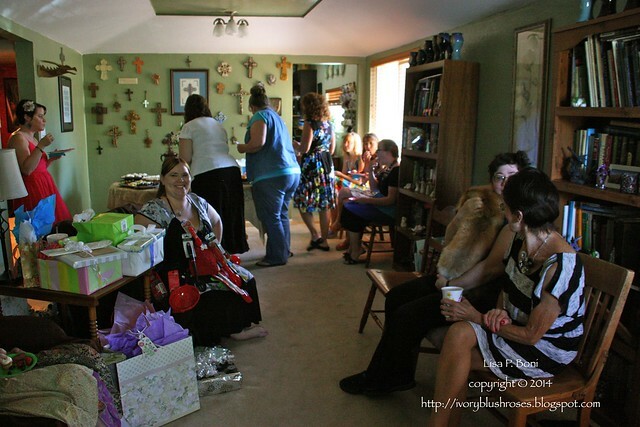 This past weekend, Jessie's Bridal Shower was held at the home of her Maid of Honor, Cassie! The apron Jessie is wearing was filled to the brim with kitchen gadgets of all kinds. Later, she took it off and we had to remember what all was on it! I was lucky enough to win that prize! We had a fabulous time and many good memories out of the afternoon! Jessie is getting excited (and a tiny bit nervous) about the upcoming wedding! The preparations are well underway and that too is just down to the last little bits to take care of! I took another tumble in the yard a few days ago as I backed over a beam and landed hard on my tailbone. At the time I seemed fine, but the ensuing days have shown that it jolted things in my lower back and neck more than I realized. A trip to the chiropractor helped some, but a few days away from yard-work with some ice in place on my joints are in order. I'm hoping it will allow me to catch up on stitching projects. I am woefully behind on round robins and have a couple of stitching projects for the wedding that need completed! I've been watching your massive project with great interest. You have done an amazing job, you must be SO very pleased as it all comes together. It's going to be absolutely beautiful for the wedding. Well done to you and all your helpers!! It's going to be a beautiful wedding and the flowers will be perfect within a few weeks. I have to say I love the green door on the garage:) What a great project that has come along so nicely. But then, I think you could turn a shack into something wonderful Lisa. Oh my goodness, I am worn out just reading and seeing all that you have done or that needs doing. It has been neat to see your progress through this project. And what a project is has been. Do be careful. When I start getting tired is when I start to stumble around and that's when I know it's time to quit for awhile. It will be a lovely wedding and I wish much love and happiness to the happy couple. Beautiful result! The wedding will have a perfect setting! Your yard and house are looking wonderful! Sorry you took another tumble...hopefully by now you are feeling better. 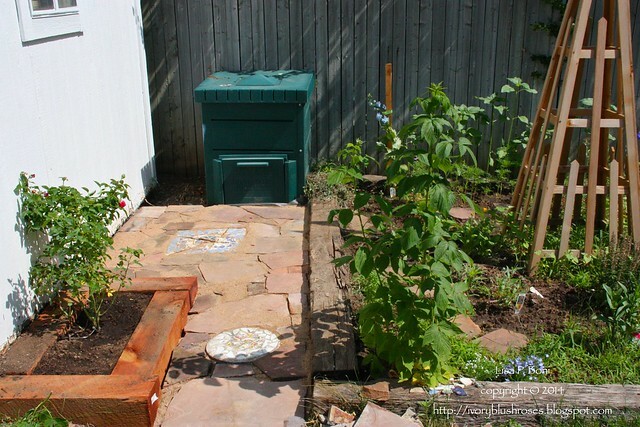 That excess soil/compost - do you have a place it could be stored? I'm thinking that the beds will settle over the rest of the year and this winter, it might come in handy next spring. Or not - sometimes storing things is a bigger pain than getting more when it's needed. Or just scatter the excess soil very thinly over the yard - the lawn will probably love it. 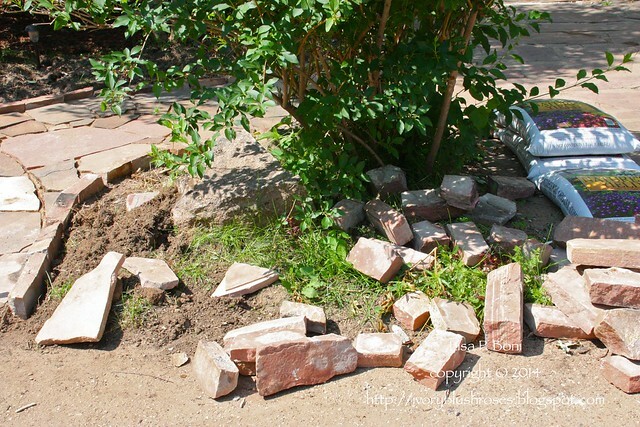 what a wonderful job you've done with your yard! By the time the wedding rolls around, it should be glorious!